Since the beginning of the project our CubeSat has changed its shape several times. While First-MOVE deployed its solar panels diagonally, we started with the “X-Wing” design which we presented to you in STR’s first blog post: http://www.move2space.de/MOVE-II/76-2/. 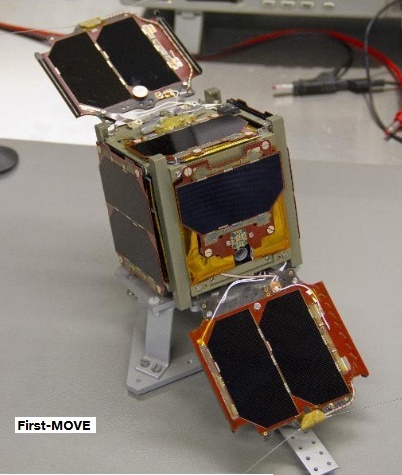 At that time our active attitude determination and control system (ADCS), uncommon for CubeSats, was expected to be a likely source for failures. Simulations showed that a “X-Wing” configuration supplies a good average in power output even when the ADCS fails and the satellite is in tumbling motion. However, the ADCS subsystem made good progress which allowed the implementation of a “Wind Mill” design, which provides an increased power output when the ADCS stabilizes MOVE-II in an optimal attitude. 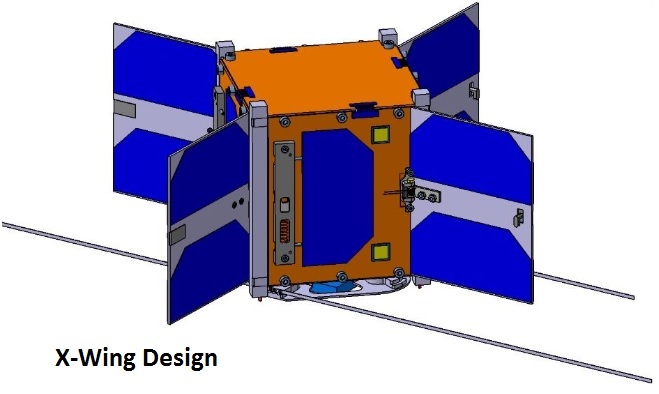 If the ADCS fails in operation against expectations, or our CubeSat is in an irreversible tumbling motion, solar cells on the body of the satellite will generate a decent amount of power that should be sufficient for the execution of rescue steps. A fourth design, the “Double Wind Mill”, which generates even more power output, is not actively developed anymore, because the current power budget copes without the extra power. ADM: “Antenna Deployment Mechanism”. Our antenna is rolled up and stored inside a cassette, which itself is covered by the flap panels on all four sides. As soon as the flap panels are released, the sides of the cassette are uncovered which enables the pre-stressed antenna to deploy. However, this deployment strategy is not redundant on its own, which lead to the development of a secondary, back-up strategy that will be applied if one or more flap panel fails to deploy and thus also prevents the deployment of the antenna stored behind it. 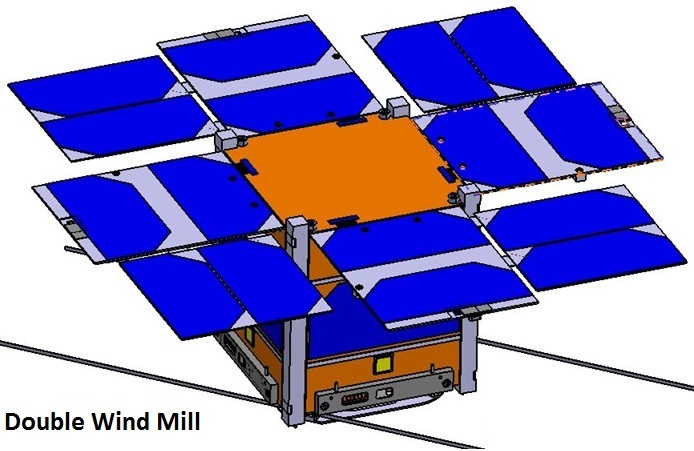 The cassette is connected to springs, pushing it away from the CubeSat’s bottom, but held in place by one eSMARD. So if the flap panel deployment fails, this eSMARD can be activated to release the cassette. It will be pushed away from the CubeSat/ flap panels until its sides are uncovered and the antennas deploy. But without the independent flap panel deployment mechanism, the antenna deployment was not redundant anymore. 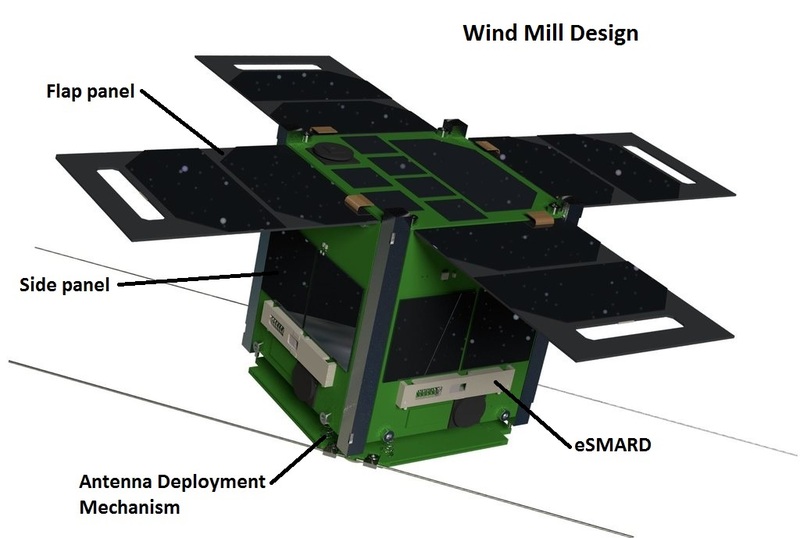 So at the moment we are developing a redundant eSMARD (like in the next picture, but in a lying position), among other things, and are working towards the Critical Design Review (CDR).